Hilary and Obama are about to have their alleged death-match (does anyone remember that TV show from some years back--"Celebrity Death Match"? It was very funny until it got very gruesome), maybe I'll check it out. Why is the food talking? This is how one of my companions describes the way Hillary is looking at Obama when he talks. Solazyme is pursuing an unusual process for using algae to produce liquid fuels including biodiesel. In the Solazyme approach they keep the algae in the dark and feed it sugar. This is not a new approach. Politicians have been doing this to journalists for years. I've been meaning to give an update on our music program for some time. As regular readers will know, I've taken an interest in the quality of our parish liturgies, particularly trying to have an appropriate dimension of catholicity--being part of the whole Catholic tradition, not just what has been current in recent decades. 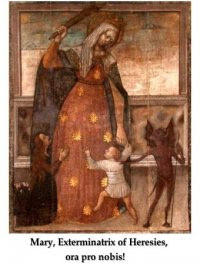 So, we have incorporated some prayers and hymns in Latin, precisely as Vatican II called for; for my part, I try to chant the prayers as I can; we make full use of all our Catholic, "special effects" which add so much meaning to prayer, such as candles, incense, carefully executed ritual, and so forth. The music director for the two parishes I pastor has been an eager and inspiring leader in this effort; he has called together a schola which is focusing on Gregorian chant and polyphony, and it is growing; he has more men than women, and participants of all ages, including a couple in high school. There have been some objections, and I've handled it several ways. I've given explanations, in the bulletin, from the pulpit, in conversation and letter. I gave a series of talks on Sacramentum Caritatis, the holy father's exhortation on the Eucharist, which seemed as good a setting as any to address any neuralgic issues such as chant, incense and Latin. I've included exerpts from the U.S. bishops recent document, Sing to the Lord, while having some unevenness, nonetheless strongly recommends the very things we've been doing and therefore makes clear this isn't just my wild hare. But, in the end, sometimes it's necessary to compromise, so I let it be known that folks who would not abide Latin, could go to three of the Masses, and no Latin, just as we do with incense. (In fact, I put a "smoke alert" in the bulletin letting people know when we will include incense in the Mass.) There was a period in which we used only a little Latin. A funny thing happened--I began getting feedback that folks were disappointed: we like using Latin, why aren't we doing as much? I told this story in the bulletin. > For Lent, we've used an English introit from the Psallite collection. The English text closely, but not exactly, matches the English antiphon in the Missal. We provided them on a handout, with all five weeks' antiphons on it. People are singing it, and they can listen to the cantor sing the psalm text that goes with it, it's very prayerful, people can actually observe the procession, which is important, and it's nice not to hear all the song-books being shuffled around as I lead the sign of the cross. Today I discussed with the music director the possibility of using a handful of them during Ordinary Time, or at least, for part of it, and see how that goes. > We are using the confiteor, followed by a kyrie, composed by our music director, based on a familiar Gregorian chant; last Sunday, the choir sang it, and I found it transcendant. Unfortunately, due to resistance on the part of some to any Latin (nevermind the Kyrie is Greek), we don't use it at the 4 and 5 pm Mass, and 7 am has no organist or choir. But we do use it at 9, 10:30 and Noon. > The responsorial psalm is chanted sans accompaniment. People are singing it with more confidence each week; it's a prayer, not a song. Occasionally we have a cantor proclaim the psalm from the pulpit, which is very appropriate, but they don't often like to do that, and it's hard without the music director handy; and of course, if he's singing it, he does it from the choir loft. > We introduced a new Sanctus (in English), which is on the backside of the introit handout. It's not new, really--it's from the Missal, and people are picking it up. My goal, of course, is to have an English Sanctus we can use more than during Lent. One reason I wanted to try a new English Sanctus is this is sung the weakest of any of the prayers the people sing. Actually, they often sang the Latin Sanctus better; but even so, we still want to have an English Sanctus people will sing. > Our mysterium fidei for Lent is "Dying you destroyed our death; rising you restored our life; Lord Jesus, come in glory." When I arrived, it was always "Christ has died..." and I thought we should use the others, particularly as I think, given the choices, they are superior--they address the Lord present, rather than speak of him in the third-person. For Easter, we'll use, "Lord, by your cross and resurrection..."
> The Schola did a splendid job for Ash Wednesday. I'll quote my music director, from his blog (see links to the right of your screen): "We sang a new English version of the Proper Introit, an original Kyrie which I composed, and some motets that we've been learning - O Bone Jesu, O Esca Viatorum, O Vos Omnes(which we will use again on Good Friday), and a Peloquin piece, In Memory of You/Ave Verum." In addition, we sang the Latin Sanctus and Agnus Dei. > For Sundays at the 9 am Mass, they have been singing the Latin communion antiphon, after which we use something in English. For those who think that's not enough: baby steps. > For Holy Week, we'll have two processions -- one the principal Mass at each parish -- and we'll have solemn liturgies throughout; the choirs have been working on it since January. We hope to do the reproaches on Good Friday at the more solemn, day, liturgy. For the Vigil, we'll proclaim all the assigned readings. > For Easter Season, we'll use the Sanctus from the Missa de Angelis at the 9 and Noon Masses. We'll have incense at those Masses as well. > In addition, the schola is developing a number of Latin motets, which they are including more frequently at the 9 am Mass, occasionally at 10:30 am. And we occasionally use the Agnus Dei in Latin, which seems no longer to be an issue; but again, only at 9, 10:30 and Noon. Some may fault me for compromising, and not using any of this at some Masses. However, if I'm correct about the wisdom and power of this, then that will, in time, become evident; who knows but down the road, folks will say, "how come we don't do that nice stuff at this Mass?" And if enough people ask for it, we can include it. In the meantime, only the most unreasonable person objects to other people enjoying what they don't enjoy. This comes from a new web site I'm hearing about everywhere: Catholics Come Home. I looked through this site Friday; it looks good, and I'm glad to highlight it. 2) In giving steps to coming home, please mention the sacrament of penance! In my own case, I was away 10 years, and yet--when I realized the jig was up, and Christ wanted me back in the Catholic Church, I knew what to do: I headed to the nearest Catholic church, got in the line for confessions, and began..."Bless me father, for I have sinned; it has been ten years since my last confession..." In ten minutes, I was "back"! Anyway, back to the video...pretty awesome, huh? Did you choke up? I did. *I.e., when the Church gives a decree of nullity, it is responding to the question, was this attempted, sacramental marriage, actually valid as a sacrament? Or was something lacking? It's like when you bake a cake; if you put in all the ingredients, and you drop it, and it's wrecked...it's still a cake, but a ruined cake. By the same token, just because a marriage is wrecked, doesn't mean it wasn't actually a sacramental marriage--it's just that it became a mess. That said, it's also possible that when you attempt to bake a cake, you might leave out something essential; and while it looks like a cake, it isn't a cake. And that's what happens with a decree of nullity: the Church, asked, responds, no, something was lacking. My favorite image is to use a football game; a receiver catches the pass and runs down field, into the end zone--touchdown! Wait--the coach has thrown a red flag, he's asking for a review; go to the tape. Yes, see, he stepped out of bounds. Something essential was lacking, and as a result, the play is invalid. Now, I hear you say, okay, what's essential for a valid, sacramental marriage? This will seem simple, but not on closer examination: a man, a woman, both free to marry, each other, capable of entering into marriage, and they give free consent to marriage, with the right intentions, and if one is Catholic, they marry in the Catholic form unless dispensed. There are lots of ways something can mess this up: either party is bound by a prior marriage; they give consent under duress, out of fear, there is fraud involved--one party misleads the other about something significant, they have sufficient maturity, they intend marriage as life-long, faithful and exclusive, they have not excluded any of the ends of marriage (i.e., neither said, "we refuse to have children") and so forth. But as always, we ask—what is it that will truly satisfy? that the Water she truly needs is the Holy Spirit. they say what the woman said: "Sir, give me this water"! and you are personally invited to be part of that. what an amazing statement: what does that mean? First of all, we might reflect, is that how I live? If not…we have the sacrament of confession. when I say, God is poured into my life? than who we seem to be, by the world’s standards. But if we have the Holy Spirit in our lives… what holds us back? > You and I have power to change…ourselves. We can be truly forgiven. We can have hope. How easily she could have said, "it’s too late"; "God won’t forgive me now." And, when she began her new life— don’t think her old life just disappeared. People who turn from alcoholism have a saying: "one day at a time." When you and I go to confession, we go back to the well of forgiveness and it always flows. > You and I have the power to change our world—if only a little at a time. This Sunday, you are invited to contribute to the "Catholic Ministry Appeal." Yes, this used to have a different name. But you know how people say, "I wish the Archdiocese would change"? so all the money goes to the designated causes, none to "administration." or ministry in hospitals, colleges or prisons? Or Catholic Social Services—that helps a lot, right here. These are all causes we can get behind. Through this fund, we can help change our community. to help him change other people’s lives. That’s what the woman did, didn’t she? She had to tell people! the Holy Spirit will lead you to do that, as well. convenient and it helps our parish and school. than we do about what Jesus Christ has done! He alone gives Water for eternal life! we will be united to Jesus in his Body and Blood. we live for him as members of his Catholic Church. The bread and wine back there—I have no power to change into anything! making Jesus truly present here! And the Holy Spirit can do the same to us. The snow is pouring down, and I'm at a low ebb in energy, so I'm not going to get much more work done tonight; in a bit, I'll head back to the rectory at the other parish, where there is a fish fry tonight; alas, the turnout may not be so good, and the food was partly prepared last night, so we can't do much about it now. The last couple of hours I worked on a letter to a volunteer, who had some questions that relate to "fairness"; I won't say more, obviously out of consideration for that volunteer. But if you wonder why I spent a while on the letter, well, the "care and feeding" of volunteers is pretty important. So is the "care and feeding" of the faithful, whoever they are. Again--no details--but occasionally I get a call, or an email, from folks far away who seek advice. I do what I can; but for this reason, I don't publish my email. It's not that I don't want to help, but I can't. I'm not like the "700 Club" with it's bank of "prayer counselors"! A lot of the day seemed taken up with lots of little things...one of the secretaries is working on a letter to most of the households in the parish about some building fund needs, several questions about that; other staff members had other questions; several phone calls and messages; mail to open and so forth. The day started with a finance committee meeting at 7 am; that's when people can come. We finished that around 8:30 am, then to Mass, back at the other parish. Then back here, only to find I had to run to the hospital, back by around 11:30, and the rest I already described. I was going to review the week, but...this gives you a flavor. The schoolchildren here are working on a writing project about heaven. The organizer--who reads this blog--has been working with various grades, helping them come up with essays, poems or whatever creative things they can. It's all about sparking their imagination. So he asked me if I'd be willing to address it in a homily, and I think it's okay if I do a homily once in a while about heaven! So, for the younger children, I did so yesterday at Mass. The first reading was Isaiah addressing the "princes of Sodom and Gommorah" -- delicate stuff for kids there! -- calling them to repentance; the Gospel included a criticism from our Lord of the scribes and pharisees who lay burdens on people but don't help them. Anyway, I talked about the ways heaven is different from our life here...there was a reference to the sword in the Isaiah reading...we have violence and conflict here, but not in heaven; we have heavy burdens of work and care here, but not in heaven, and so I went. Then I talked about how our church is designed to help us understand heaven. I pointed out the windows, how they showed saving events, and saints and angels--but our attention is not focused on them, they are around us, like our friends, but the focus we all have is forward--toward the altar and toward the Lord; toward the Cross and Resurrection, which becomes present at the altar and we share in communion. Well, I confess I did think about saying something about Mass ad orientem, but I went on long enough, so I stopped there. "I told you a few minutes ago how Mass is like heaven, and everything leads to holy communion. Well, the moment right after we receive holy communion? That is heaven! If we don't realize that, may God help us realize it. Now, Mass comes to an end, and we go back out into the cold; but someday, it will never end." There it is: that's the whole issue in all the disputes and attempts to get the liturgy right: the Mass is to be like heaven, and it matters supremely whether the celebration of the Divine Liturgy actually accomplishes that. The choice of music matters. The demeanor of the priest matters, as does that of everyone in church; everything matters. Before long, posting something like this will just generate too much gnashing of teeth. As we get closer to November, the one thought that will dominate so many otherwise sensible people is, the Presidency is everything, "we" dare not lose it...reminding me, to be candid, of how--in the Lord of the Rings trilogy--so many otherwise level-headed and presumably moral people became seduced by The Ring. So it is with the Presidency, which--by the way--gives so much force to the broad critique of Big Government that once upon a time had advocates in the Republican Party, but no longer: the one and only voice for that sentiment, Rep. Ron Paul, is denounced as a crank and a flake, some of which he conveniently brings on himself, but that doesn't change the fact that the other, "major" GOP candidates could only bring themselves to wear condescending, pained smiles when crazy Uncle Ron would rip into Big Government which the GOP has so vastly expanded in the past seven years, in every respect. While "respectable" Republicans ridicule Rep. Paul, they hope you don't notice that no one else in the GOP even thought the points about Big Government were worth making. Meanwhile, we have now a presumptive GOP standard-bearer who is hostile to the First Amendment; Sen. John McCain's signature accomplishment is his McCain-Feingold "Campaign Reform" law, which candidate Bush denounced as unconstitutional, but President Bush signed into law. Some say, that's just one issue--but of course, what's the Bill of Rights among friends? The salient issue for many of us of course is the end of abortion-on-demand, and most think that the only practical way to get at that is the Supreme Court; so every four years, we are told how many justices the next president will name to the High Court. The predictions keep inflating--lately, we're told the next president will "likely" name "four or five." And overwrought activists fall for it. Never mind that, since 1969, we've had seven presidents, over 38 years (not counting W. Bush's last year, still to come), and in that time, they've named how many justices? Nixon, 4; Ford, 1; Carter: 0; Reagan: 3; Bush (I): 2; Clinton: 2; Bush (II): 2; that yields an average of...1.4 justices named per four-year term; and that reaches back to the 1970s--since that time, people are living a lot longer. No one knows, but based on more recent history, two justices looks like a good estimate, not "four or five." (Of course, an asteroid could hit, and President Obama could name all nine!!! Now, there's another thing about this argument that the scaremongers hope you will be too panicky to notice. They try to make you think that if Obama or Hilary wins, the Supreme Court will get worse...but then they acknowledge that the two most likely justices to be replaced are Ruth Bader Ginsburg and John Paul Stevens! In case anyone hasn't noticed, these are the two most liberal justices. So if they are replaced with newer liberals, yes it will be a missed opportunity--but no, it won't change much of anything, at least on the issue of Roe v. Wade, which is what this all about. So the merits of the, "it's all about the Supreme Court" argument all hinges on how confident you can be that the GOP candidate will name really good justices; because I point out that it was Republican named justices who gave us Roe and upheld it in the 1992 Casey decision. So we come back to Senator McCain. And last week, Andrew McCarthy had an outstanding column at National Review Online that dealt with this. The right-leaning folks at National Review have been put through the ringer this year, as they've had a terrible time justifying supporting any of the major GOP candidates, they finally came down for Romney, only to have him go down in flames, and now they have to learn to love someone they've had no use for up until a few weeks ago. In fact, as between the two of us, it’s McCain’s supporters who are deluding themselves. I take them at their word, for example, that a hallmark of the senator’s politics is his tenacity on matters of principle. Consequently, I am skeptical of his assurances that he would appoint conservative judges who will apply rather than create law. Why? Because he has a recent, determined history of beseeching federal courts to disregard the First Amendment in furtherance of a dubious campaign-finance scheme in which he believes passionately. Conservative judges would (and have) rejected this scheme, just as they would (and have) rejected another signature McCain position: the extension of Geneva Convention protections for jihadists. Now, the appointment of conservative judges is a crucial issue — one McCain posits as central to why we should prefer him to Obama and Clinton. Thus supporters breezily wave off such concerns, maintaining that McCain both promises there will be no issue-based litmus tests for judicial nominees and has conservatives of impeccable legal credentials advising him. But for me to conclude McCain would surely appoint conservative judges, I also have to believe campaign-finance and the Geneva Convention weren’t all that big a deal to him after all — a possibility that runs counter to everything McCain’s fans tell us about his fidelity to principle. He’s fought tirelessly for years, in the teeth of blistering criticism, to establish campaign-finance regulations, and I’m now supposed to believe he’ll just shrug his shoulders and meekly name judges who’ll torpedo the whole enterprise — all in the name of upholding a judicial philosophy I’m not even sure he grasps? How exactly is it deranged to have my doubts? In fairness, McCarthy tips his decision in favor of McCain--"because of the war"--not for anything else. For those who continue to make this all about the Supreme Court, let me offer two more thoughts. First, it seems clear to me that McCain will continue the job President Bush has done of wrecking the GOP as a conservative party. I see little reason to hope McCain's election will foster the GOP retaking Congress. People tend to like divided government, and McCain tends to get along better with Democrats in Congress; and Presidents generally tend to work with what they have; thus Clinton happily "triangulated" with the GOP majority, too bad for his fellow Democrats in Congress. And the excuse, then, for McCain to name the wrong sort of justices--more David Souters--will be..."that's the best we can get confirmed." Second, despite the claim that justices are "above politics," they do tend to prefer to be replaced by presidents of the same party that named them: Thurgood Marshall tried valiantly to outlast Reagan, White stepped down during Clinton's term, despite being anti-Roe; it's not an iron law, but it often happens. All things considered, if Scalia (the third justice folks guess might depart, based on age) were to contemplate retiring (I rather suspect he is there till the end, but who knows? ), isn't it somewhat more likely he'd do so under McCain than Obama? So, while I don't agree it's all about the courts, even on that one issue, the most probably outcome is McCain naming more Kennedy or Souter types, and if he replaces Scalia, then guess what? The Court gets worse! Yes, I hear you saying, "but wouldn't that happen with Obama or Clinton?" Yes it would. "So what's the difference?" The difference, dear reader, is that prolifers and other concerned folks could, at least with Obama, make good come of it. It would be very hard to get GOP Senators to vote against a McCain-named justice; but far easier against an Obama appointee; indeed, the McCain appointee would come wrapped up to look like a "Roberts or Alito" and they might just pull it off until the key vote comes several years down the road. (I here note in passing that we still don't know that "Roberts or Alito" are actually all we hope to be, on Roe.) But all Obama's stirring rhetorical gifts will not convince a single prolifer that he's naming another Scalia. And a President Hilary would be a gift that would keep on giving: she would, almost single-handedly, revive and rebuild the conservative movement nationwide, state legislatures would go GOP from coast to coast, along with the Congress, and they'd actually start doing useful things--just as happened under Bill Clinton, if you recall. Till now, we haven't even discussed McCain's stance on more direct prolife issues: that's because, here again, he represents a sad continuation of W. Bush's wrong direction. When W. ran for president, he was in favor of abortion in "rare" cases--a position that cannot be maintained in any principled or even rational way. If it's wrong to kill an unborn child, the parentage of the child makes no difference. That position at the time represented a significant departure from what had been prolife "orthodoxy"--the prolife movement had successfully gotten Reagan and yes, even Bush I, to take a 100% position (and Bush I, despite many other sellouts, never went south on his prolife promise). But Bush II was allowed to sell out partially, because..."he's the best we can get." Now that's no longer even recognized as a sellout; and the fact that he actually opened the door to embryonic baby-destroying research is overlooked, as is the fact that his vaunted prolife record is a record of nice words but doing the bare minimum--all while he had something no other supposedly prolife president did: a Congress under allied leadership. "Because it's all about the Supreme Court!" McCain has repeatedly voted for tax-funded baby-destroying "research." Yes, Obama and Clinton will be "worse" on many other prolife issues, but with the exception of tax funding for abortions (which a GOP Congress can prevent, and did under Clinton), this is the issue that is most likely to come to the next president in the form of legislation. There's not a doubt in my mind that if McCain is president, he'll work to prevent any really good legislation from coming to a vote, because that's just what he always did as a Senator. And given where we stand with Roe, and given the dim hopes McCain will make any difference there, except for the worse, there's not much the pro-aborts can do, realistically, to make things worse. The main front will be "research"--where McCain is as bad as the Democrats. Then there is McCain's habit of periodically lining up with Democrats, against Republicans, on issues that conservatives care about: he voted against Bush's tax cuts (now he loves them), backed an immigration bill that meant amnesty for millions of folks illegally in the country, and has been making disturbing noises about "climate change" that make one wonder: what will McCain's next apostasy be? Meanwhile, as Ohio's primary approaches, I have to decide if I cast a "protest" vote for Huckabee or more likely, Ron Paul, or if I vote in the Democratic primary, which actually still is a race, and decide which of them is "less bad"? A dreary prospect. All this and more may explain why the GOP primaries drew lackluster participation, even before the outcome became clear, while the Democrats are generating huge turnouts. It may be that President Bush has done his demolition work too effectively, and the GOP faces a rough November. If so, the GOP might want to think long and hard about what they stood for when they used to win. there was a movie called Wayne’s World. who was kind of a geek; nervous and shy. and Garth sees a pretty girl he’s had his eye on for awhile. And Garth is carried away! If you’ve been in love, you’ve had that experience. But the question is—did Garth imagine what he saw? that was there all the time? That’s what happens in the Gospel to the Apostles. that was there all the time. you have the opportunity to experience that! just as he was with the Apostles. I mean, of course, his presence in the Eucharist. would have been very ordinary. and all we perceive is…the ordinary. but rather, this is holy ground. as he did in the first reading for Abram. Do you realize most parishes don’t have what we have? Yes, but we have a hard time tuning in. to help us focus and tune in. In your pews are forms and pencils so you can sign up. In a moment, we’ll have time to fill that out. see if you don’t experience something powerful? “Lord, it is good for us to be here”? maybe you will wonder, what can I do with an hour? you will discover it fills up very fast with his presence. You will run out of time before you run out of prayers. have to make an effort to keep the romance alive. just like when you first went out. to keep seeing each other the way Garth saw that girl. and if we are to experience his glory in our lives. There is a weight of glory that fills St. Clare Chapel. it helps us perceive more of His glory everywhere else. you and I will be experience his death and resurrection. so that we can bring it with us, out into the world. I'm still looking for a suitable, marble, baptismal font for use in one of my parishes. I've had several leads; one I couldn't pursue before it was sold, another that, upon examination, seemed too damaged, and others that just didn't pan out. How unfortunate that parishes close, or worse, clear out beautiful works of art; but wouldn't it be wonderful to have such things be put back into use? Maybe you know of a church that has closed, or cleared out beautiful stuff? If you made a call, and found out a font was lying about, unused, and let me know, that would be great! Marble baptismal font, with a bowl approximately three feet wide and broad (i.e., a lot of traditional baptismal fonts have very small bowls, what I want is rarer), and the whole font should be about waist-high. I'd love to have the entire font--i.e., bowl and pedestal, however, I have a wooden pedestal that maybe could be married to a suitable bowl. The color should be, of course, basically white or off-white, but if you know marble, it usually has some varied colors in it. Of course it doesn't have to be in perfect condition, but it has to be usable/repairable. I'd be grateful for any help in spreading this around. Feel free to respond in comments, but if someone wants to give contact information more privately, use: frmartinfox@yahoo.com. I made my retreat this week at St. Meinrad Abbey in southern Indiana, about 60 miles west of Louisville. I've been on retreat there before, although its been a few years. They built a new guest house, which is very nice; I recommend it. The monks get up at 5:30 am to pray the morning office; but pastors on retreat get up when they get up. It was very nice to focus on prayer and have time to read. I left there this morning, and got back to Cincinnati about 1 pm; I thought I'd see a movie. I decided to see Cloverfield, (warning: I'm going to talk about the plot!) mainly because it's about a monster wrecking Manhattan -- what's wrong with that plot? Here is what I have to say about the movie: it's a great movie to see, if you want to throw up. I didn't realize it was filmed, like Blair Witch Project, in "Herky-Jerky-Vision" (the idea is that the whole movie is filmed on a hand-held camera) and I spent most of the film with my eyes closed. I should have left, but I came to see the monster! And it was a pretty impressive creature. After that, I headed to Dayton to meet a brother priest for dinner, but I was ahead of schedule, so I did a little shopping; I needed some shoes and some sweaters, and lo and behold, they were marked way down as I think they usually are this time of year. I don't make a point to visit malls; my favorite method of shopping is like that of military special ops (at least as movies tell the story): get in, get "the package," and get your team out double-time!. Anyway, I walk into the mall, and my stomach is still doing flip-flops, and I think, "I need to eat something"; then something hits my nose that smells really good; it's a pretzel stand nearby. "What can I get you Sir?" a pleasant young lady asks me; "whatever that is that smells so good!" It was a cinnamon pretzel; okay, sounds fine. "Would you like some icing with that?" Okay, I guess. Three bucks and change later, I look at what I have: a soft pretzel, completely encrusted in sugar and cinnamon, and just in case I'm feeling a little sugar-deprived, a little container of "dipping sauce." What? No ice cream or sprinkles? Have you been to a mall lately? (I get there a couple times a year, I'm not totally out of touch.) Have you walked by an Abercrombie or Hollister store? Does anyone else think there is something very wrong going on here: the only thing you see is a huge poster, in the doorway, featuring four or five very attractive young people (they looked about college age) artfully photographed in black-and-white, and--this is the notable point for a clothing store--that they wore clothing seemed an afterthought. One young man seemed in danger of stepping out of his jeans entirely, the only article of clothing he was wearing. A similar emphasis on "male pulchritude" (to use William F. Buckley's uptown expression) carried through in the other posters I could see as I walked by. Next store was "Abercrombie for kids" -- the main franchise is aimed, supposedly, at college and above, while this other store is aimed at high school; yeah, right. meanwhile, "Hollister" is a subsidiary of Abercrombie that, from all appearances, takes essentially the same approach. Parents, what do you think about this? Do you think this is okay? When you see these porny images--and then your kids dress that way, is that really how you want to see your kids? Anyone care to tell me I'm making too much of this? After this, I headed to the restaurant; I got there way before my friend, so I told the waitress it was okay if she ignored me (and, yes, I gave her extra in the tip); when my friend didn't show at the expected time, I called him, left a message; about 10 minutes he called me back: "are you in the restaurant? Where? Stand up!" He was at another table, the other side of the place, and had been for 10 minutes or so. We had a nice visit over dinner, and I headed back here to check in, and throw some more vanities on the bonfire.